The stunning and highly controversial find made by marine treasure hunters using side-scanning sonar to detect shipwrecks in the Baltic Sea has finally been identified as a submerged monumental construction from the Paleolithic era. 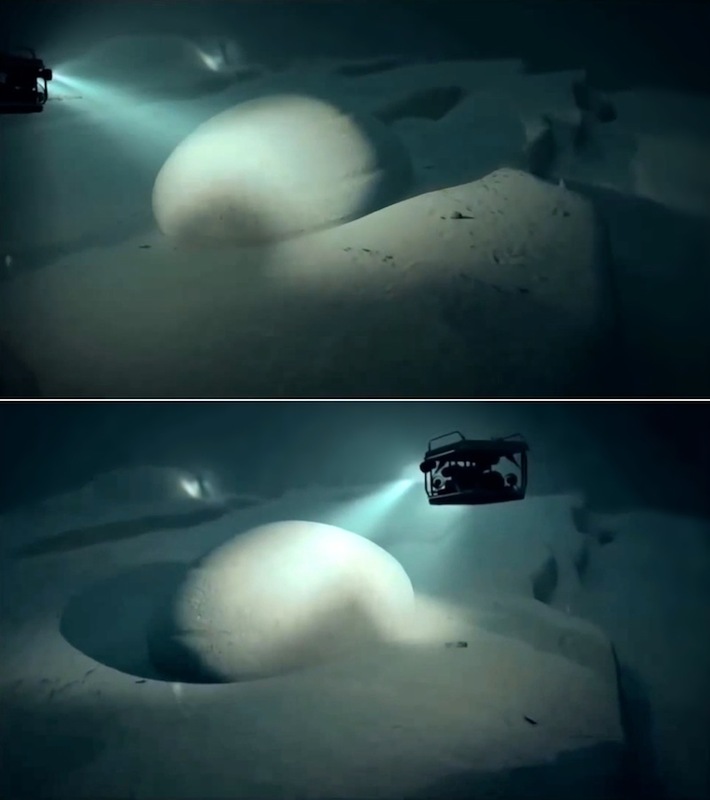 The giant circular seafloor promontory measuring ~60m in diameter is actually a terraced monument built by the highly advanced Atlantean civilization over 14,000 years ago. It looks like a round object separated from the bottom. It looks... like concrete. When we brush it off its [surface is] black. The object looks the same underneath as on the upper side. Same color too. Just like a plate on the bottom. And it has something that looks like big stairs... perhaps one meter high each step. Its strange... We have not been able to find more holes besides the 2 meter hole with a [recessed] square [formation] around it. Prohibitive conditions severely limit filming of the ancient monumental structure, especially rough seas and the very poor visibility of <1m near the bottom. Animated digital terrain models allow a clearer perspective of the massive proportions and complex geometric configuration of the submerged Atlantean monument (above). The greatest hindrance to the seafloor site investigation is an intense electromagnetic vortex that perpetually interferes with all types of electrical equipment situated on or above the ancient monument --in the vertical water column, onboard ships at the sea surface and even affecting low-flying airplanes. This special type of potentially dangerous EM vortex causes digital magnetometers and compasses to spin perpetually in proximity to the temple and directly above it, a fact that is familiar to military and civilian pilots working in the vicinity of pyramids all over the world --especially in Egypt, Mexico and Guatemala. 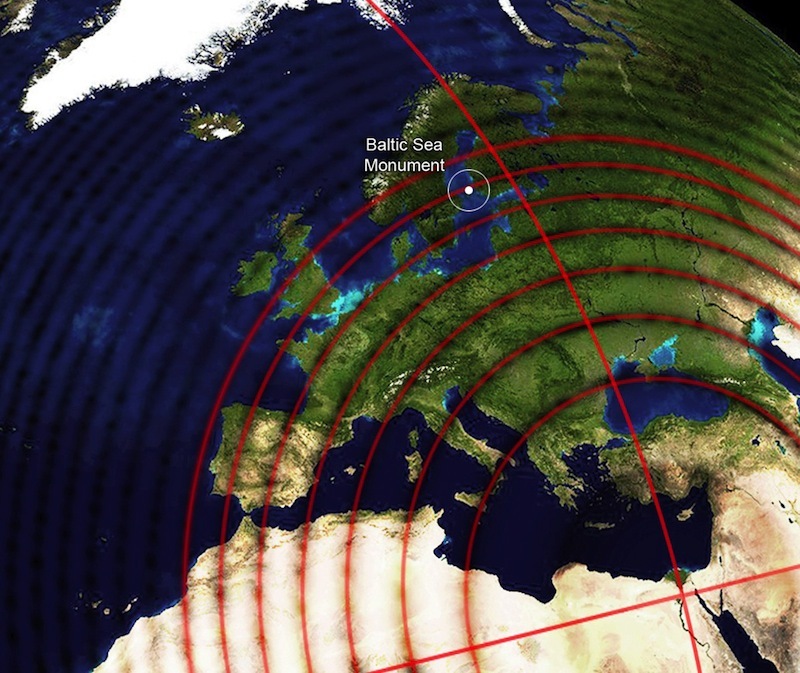 The Baltic Sea Monument (60.826°N 19.796°E) is situated 2,194 miles from the Great Pyramid; a distance corresponding to 8.81% of Earth's mean circumference distance of 24,892 miles. The artificial stonework of the monument effectively transduces EM fields from localized infrasound resonance (above). The sunken monument displays the same great circle distance from the Great Pyramid as the megacity of London, England, now experiencing intensifying spates of spontaneous piezoelectric fires and exploding manhole covers induced by infrasound standing waves resonating from the solar twins now at perihelion. The increasing interaction of our sun with its invisible brown dwarf binary companion is fundamentally responsible for the ongoing tectonic build-up culminating in the magnetic reversal of the entire binary system, with all its planets. This pattern of sharply rising volcanic activity has been directly correlated with precise length-of-day measurements that detect millisecond alterations in Earth's rotation (Palladino et al, 2013). As especially designed by Atlantean engineers, binary solar dynamics are presently activating terrestrial infrasound fields and corresponding EM fields transduced by the worldwide network of pyramids, megaliths and terraced temple structures, such as the submerged Yonaguni and Baltic Sea monuments. The sharp geometric design of the giant discoidal temple structure displays parallel corridors with flat, vertical walls and horizontal terraces forming perfect 90°-angled corners that can be clearly observed in the latest digital bathymetric animations of the impressive Baltic Sea temple (video stills above). The most conspicuous man-made geometric structure on this massive stepped platform monument is a large hemispherical dome feature emerging from the slimy silt (below) that likely served to focus ultra- and infrasonic waves into a hemispherical inner chamber, accessed from the adjacent recessed corridor. The elevated position of the submerged Atlantean temple site provides for slightly greater current flow over the structure that has reduced the total amount of silt deposition on the monument over the course of ~14,000 years since its cataclysmic submersion. The upper platforms of the great sunken temple are covered in only 10-20cm of silt, allowing the Ocean X divers to discern huge geometric symbols cast into the ancient cement building that represent Paleo-Sanskrit hieroglyphs of the global Atlantean culture. 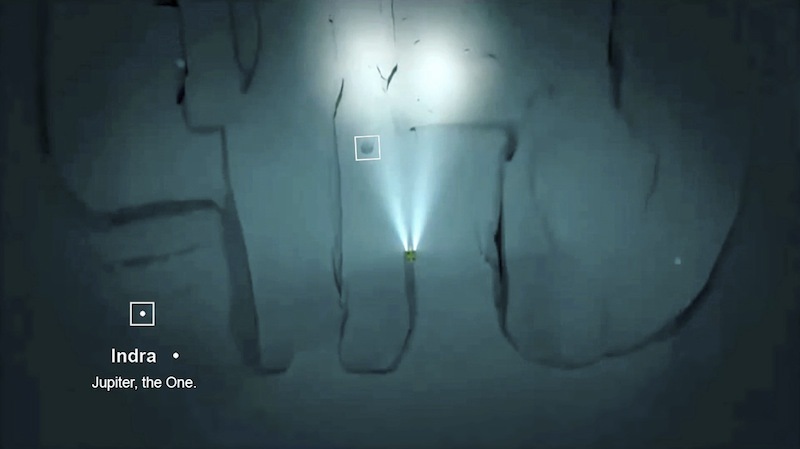 "The 2 meter hole with a square around it" described by lead investigator Dennis Aasberg forms a sacred votive ligature combining the symbols of a square and a dot at its center. 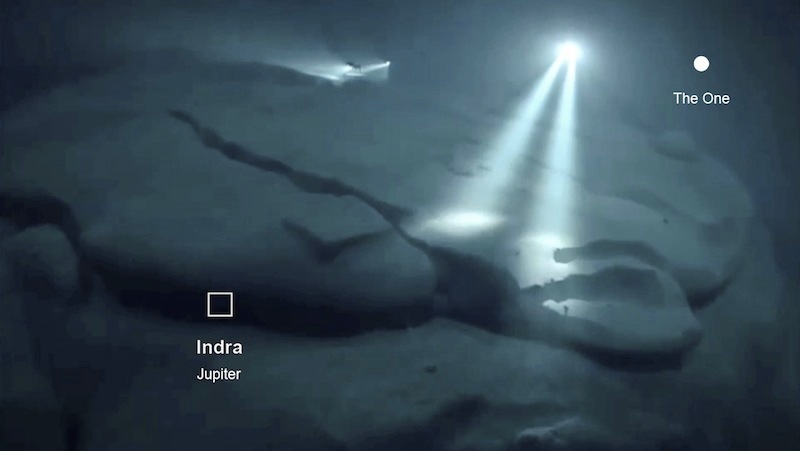 The square glyph represents a planet, while the dot represents a numeral, together reading: Indra * , meaning "Jupiter, the One" (below). This phrase was also airbrushed in charcoal paint on the >19,000 year old geopolymer limestone cement walls of Lascaux Cave, France, as a square with a long row of dots reiterating "Jupiter, the One, the One..." The same Atlantean votive phrase was cast in hieroglyphic format multiple times in magnetized basalt stonework at Puma Punku megalithic temple, constructed ~11,000 years ago at Tiwanaku, Bolivia. Elevated square healing platforms referencing the transduced infrasonic resonance of the plasma giant Jupiter are prominently featured at both Puma Punku and the Baltic Sea monument. [I]n that sojourn in the earth environment in what is called Poseidia, in Atlantis... we find there had been the separating into groups... The Sons of Belial were... those that sought more the gratifying, the satisfying, the use of material things for self,... those without a standard of morality... save of self, self-aggrandizement. These were not only the rays from the sun, set by the facets of the stones as crystallized from the heat from within the elements of the earth itself, but were as the combination of these... For it was these gases, these influences that were used for what we call today the conveniences as for light, heat, motivative forces; or radial activity, electrical combinations; the motivative forces of steam, [HHO] gas and the like for the conveniences. Cayce's exceptionally detailed trance statements identified a technological class of Atlantean crystalline stone consisting of a "combination" of "the elements of the Earth", corresponding to the modern scientific definition of a geopolymer, of the same class as the reconstituted limestone blocks of the Great Pyramid. 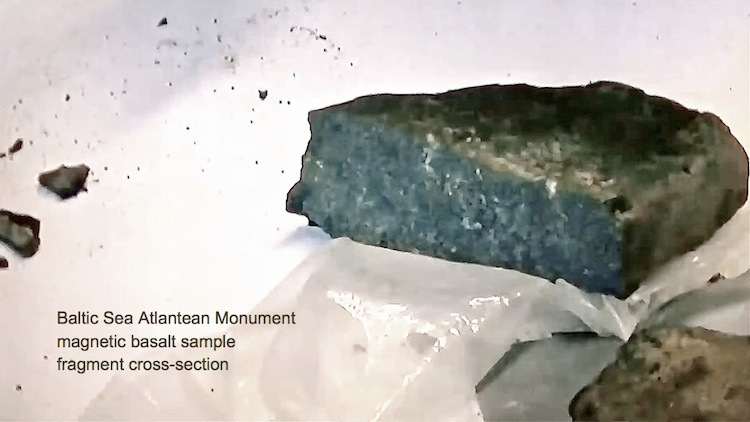 A multilayered, roughly rectangular sample of the stone-like material composing the monument was found laying on its surface, under several centimeters of silt at a depth of ~85m (above). 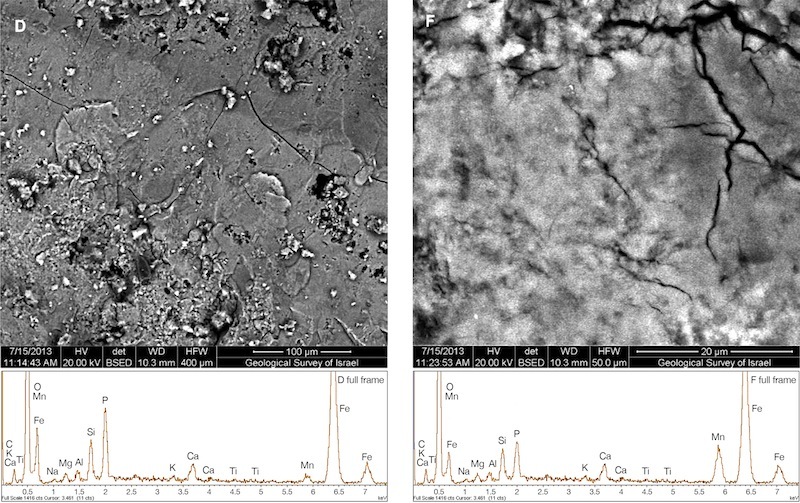 The sample was subsequently broken into several fragments for conducting various petrological analyses, including chemical resistance tests, morphological characterization by scanning electron microscopy (SEM), and determinations of elemental composition by energy dispersive x-ray spectroscopy (EDS). An initial visual inspection reveals an abundance of fine metallic inclusions throughout the stone-like material that appears to have been reconstituted from a finely pulverized mixture of basalt, quartz and tourmaline, conferring piezoelectric properties to the composite artificial basalt material. Rust-colored areas denote iron particles, while the shiny metal flecks display unnatural purity and concentration. The sample taken from the object [was] analysed by the Weizmann Institute in Israel. Their tests indicate this is no ordinary rock. It contains abnormally high concentrations of titanium, manganese and iron. The metals are all key materials in the manufacture of high-tech aerospace components. Surprising EDS results identified high metal concentrations of iron, manganese and titanium elevated far above standard abundance values for natural, geologically-formed specimens (above). Manganese and titanium are paramagnetic metals not found in pure states in nature, but as mineral compounds. Iron is ferromagnetic. 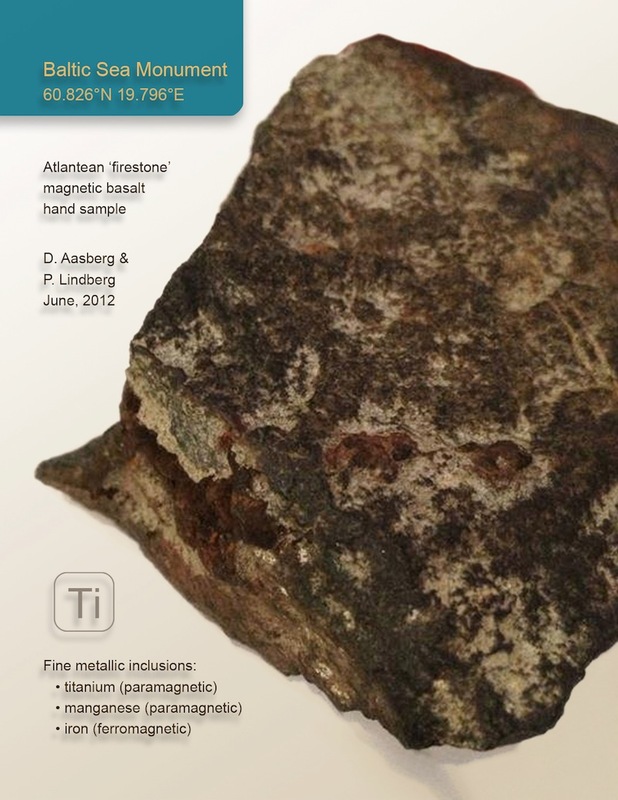 The high-tech metallic composition of reconstituted basalt comprising the Baltic Sea Monument decisively indicates a man-made origin for the extensive site as an ancient geopolymer fabrication, matching similarly manufactured stones from Paleolithic pyramid complexes in Visoko, Bosnia; Cianjur, West Java, Indonesia; and La Maná, Ecuador (video above). Microscopic examination of synthetic stones from these pyramid sites revealed an additional feature: networks of microfissures. As seen in natural mudstone conglomerates, microfissures result from the material slumping during a semi-fluid phase before curing to full hardness. 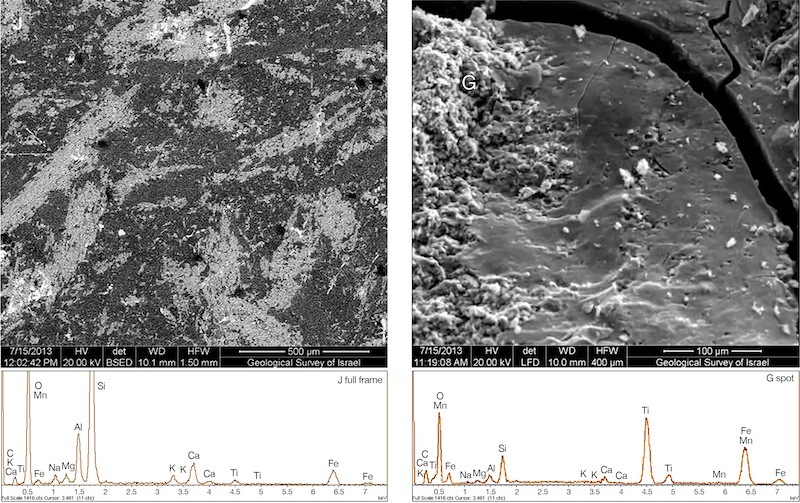 These remarkable findings are consistent with modern cements and reconstituted stones that display characteristic microfissures that result from slumping in a mold during artificial casting processes. Identical microfissures have been observed in the magnetized andesite megaliths of the Gunung Padang Pyramid in West Java, Indonesia, where spinning compasses and other EM vortex phenomena have also been documented. The Indonesian government has completely blocked the release of information regarding the inner chambers, waterways and tunnels discovered and excavated within the Padang Pyramid years ago. Ongoing criminal subversion of the advanced technological remains of Paleo-Sanskrit civilization is closely linked with the work of Nikola Tesla. Atlantean pyramids, stepped monuments and megalithic temples conform to a global wireless power and telecommmunications network displaying a spherical Fibonacci distribution pattern defined by the quantum function [ zn+1 = zn2 ]. Infrasound is transduced and focused by Atlantean temples through the same standing wave resonance principles rediscovered by Tesla in 1899. The sunken monument's unusually slanted staircase was specially designed for use by ~1m dwarves on the far left side, by humans on the mid-left and by ~4m giants on the right side of the wide-access staircase. This group included the 'little people' known to Shoshone culture as Nimerigar (ie. the 'Pedro' mummy), and the Nephalim of Biblical legend --a giant, domineering extraterrestrial species associated with human sacrifice and cannibalism-- best known from skulls excavated at Paracas, Peru. The many profound sociological, technological, historical and linguistic implications of the Baltic Sea Monument have certainly contributed to Swedish Naval interference with the Ocean X marine expedition in June, 2012, as reported by team leader Dennis Aasberg. He asks the obvious, unanswered question: "Why [does] the [Swedish] military want to take part in this [marine site investigation]?... What do you think? Perhaps they already know what [it is that] we have found?" 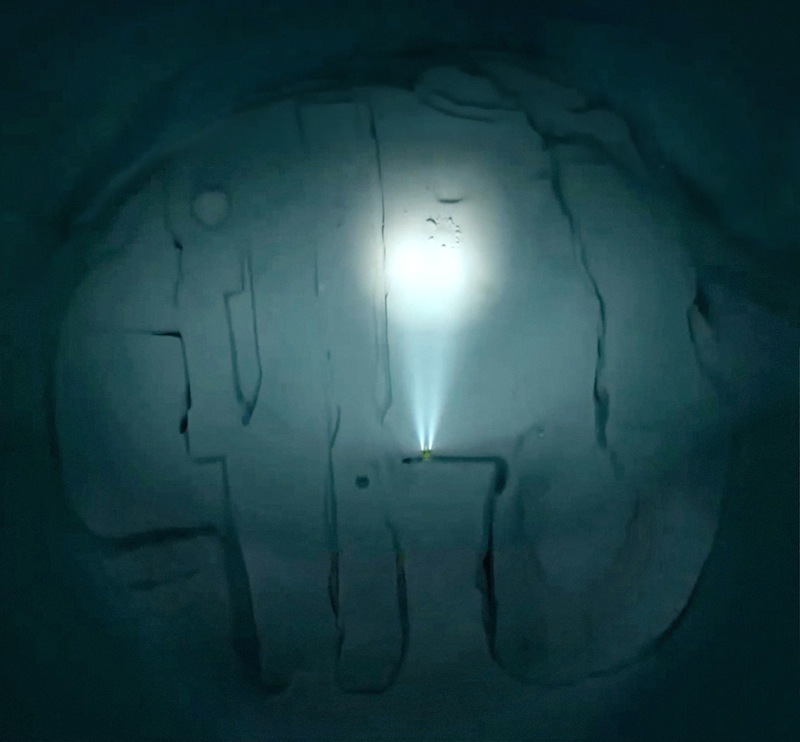 The strong 40-50 MHz signal registered by the ROV in the immediate vicinity of the massive Atlantean monument corresponds to a very high frequency (VHF) sonar beam, most likely emitted from the group of 6 command ships deployed by the Swedish Navy to intercept the June, 2012 expedition. The Naval group waylaid and actively disrupted Ocean X investigators by beaming the monument with high-intensity sonar, intentionally overloading electronics with the strong EM field resonantly transduced by the firestone. Subversive goals being deceptively pursued by the Swedish military pertain to the ongoing worldwide governmental cover-up of 'free energy' technology embodied by ancient pyramid complexes on every continent, still being hidden from the general public. 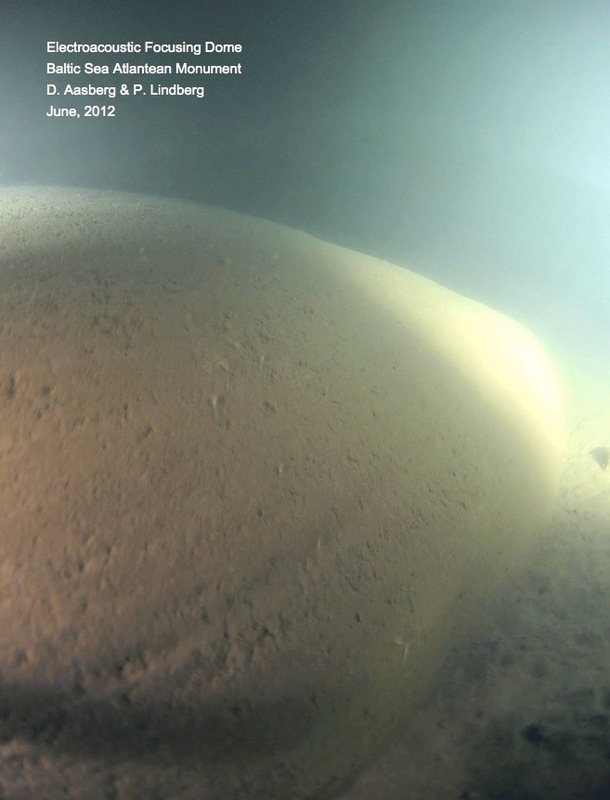 Wide ridge formations at the Baltic Sea site have been recognized by Ocean X researchers as elevated causeways linking the main circular monument to 2 nearby megalithic structures that have been only partially revealed by initial side-scanning sonar surveys. 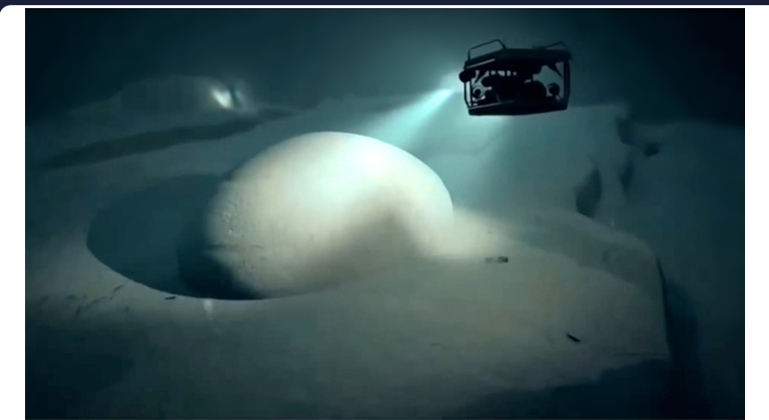 As for the Ocean X team's Baltic Sea site investigation, pathocratic interests are being enforced by the Swedish military along with TitanTV Media, which delayed film editing for 6 months without explanation and effectively silenced Aasberg's team with piecemeal project funding and mandatory non-disclosure agreements offered under the guise of purchasing film rights to all data produced by the investigation. As the regrettable truth sets in for the Ocean X team that corporate television production contracts are just part of the government-orchestrated delay/cover-up scam, they will be pleased to learn the 'anomalous object' has finally been resolved and demystified here, for the first time, reintegrating the advanced physics of magnetic resonance that empowered that magnificent era of Atlantean high civilization.